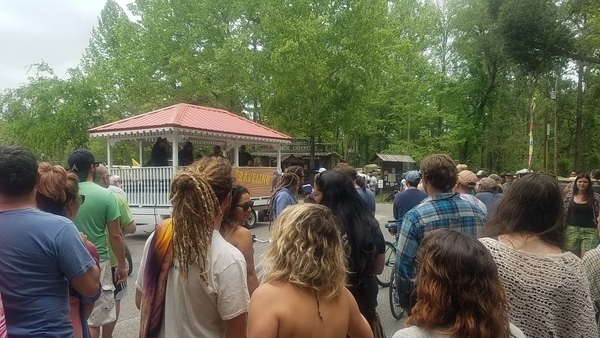 As we move ever close to the environmental consciousness of festivals like Telluride and Rockygrass, we’re starting to see more advocacy groups devoting their time to Wanee. 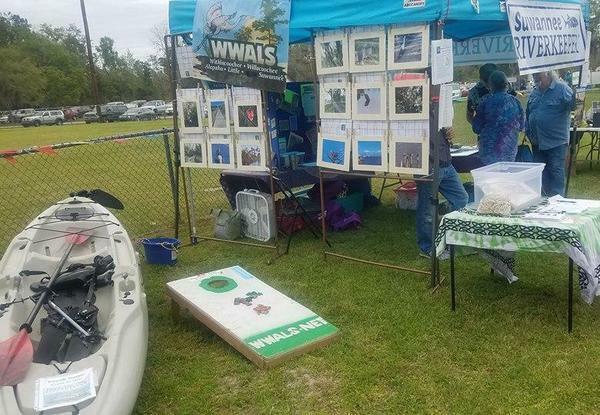 WWALS is a nonprofit educational corporation advocating for watershed conservation and stewardship of the Withlacoochee, Willacoochee, Alapaha, Little and Suwannee Rivers. 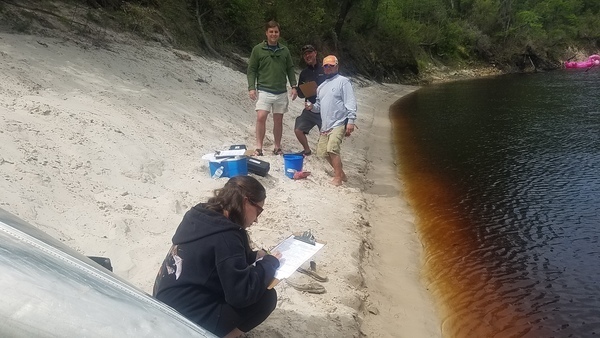 Mad props to WWALS Watershed Coalition, Inc. for their work with the Alapaha River Water Trail and the First Annual Suwannee Riverkeeper Songwriting Contest. These are perfect reasons to get involved. 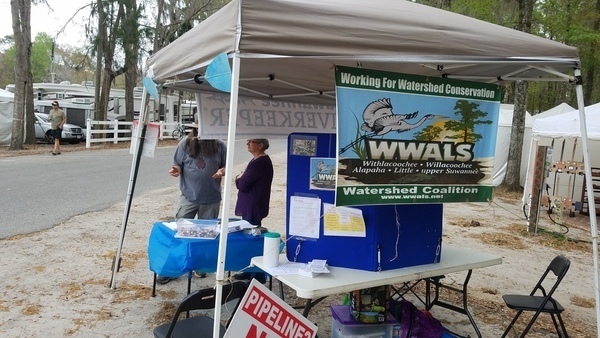 Visit their website for upcoming outings and events or email them at wwalswatershed@gmail.com and contact@suwanneeriverkeeper.org. Photo: John S. Quarterman for WWALS at Wanee April 18, 2018. 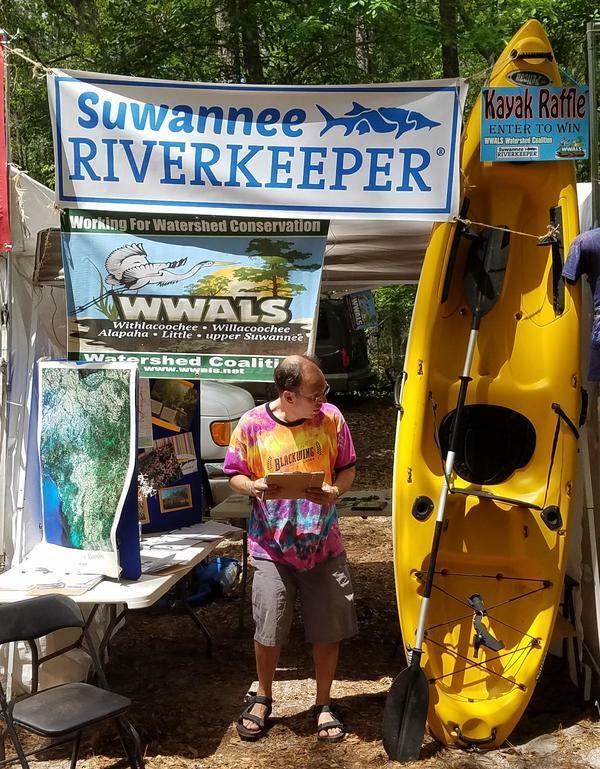 This entry was posted in Festival and tagged conservation, Festival, Jason Nail, NailTravels, north Florida, river, SOSMP, south Georgia, Spirit of the Suwannee Music Park, SRWT, Suwannee River, Suwannee Riverkeeper, Wanee, watershed, WWALS, WWALS Watershed Coalition on May 21, 2018 by jsq. 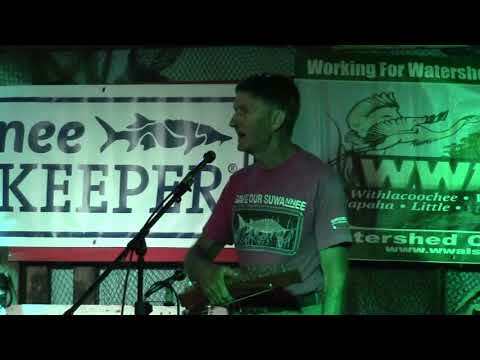 The first to submit a song is David Pharr of Suwannee Canoe Outpost on the Suwannee River in Suwannee County. We can’t tell you the title, lyrics or music of Dave’s submission, because that wouldn’t be fair to the other submissions which will be pouring in. And no, we won’t publish your name unless you agree to that, as Dave did. This entry was posted in Songwriting and tagged conservation, David Pharr, Florida, Live Oak, north Florida, river, Songwriting, SOSMP, south Georgia, Spirit of the Suwannee Music Park, submissions, Suwannee Canoe Outpost, Suwannee County, Suwannee Riverkeeper, Wanee, watershed, WWALS, WWALS Watershed Coalition on May 2, 2018 by jsq. Awful early after a late night at Wanee, we went down to the Suwannee River at the music park and did water quality testing training. Sara Jay, Ryne Nimmo, Steve Miller, Scotti Jay; photo by John S. Quarterman for WWALS, 2018-04-21. This entry was posted in Quality, River and tagged conservation, Florida, Georgia Adopt-A-Stream, John S. Quarterman, north Florida, quality, river, Ryne Nimmo, Sara Jay, Scotti Jay, SGRC, SOSMP, south Georgia, Southern Georgia Regional Commission, Spirit of the Suwannee Music Park, Steve Miller, Suwannee River, Suwannee Riverkeeper, testing, training, Wanee, watershed, WWALS, WWALS Watershed Coalition on April 21, 2018 by jsq. 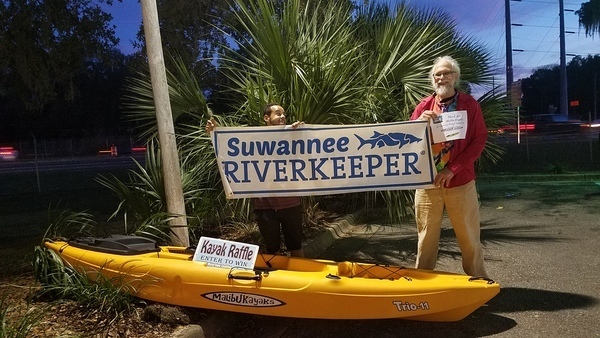 This entry was posted in Festival, River and tagged conservation, Festival, Gretchen Quarterman, north Florida, river, Sara Jay, Scotti Jay, SOSMP, south Georgia, Spirit of the Suwannee Music Park, Suwannee River, Suwannee Riverkeeper, Wanee, watershed, WWALS, WWALS Watershed Coalition on April 19, 2018 by jsq. 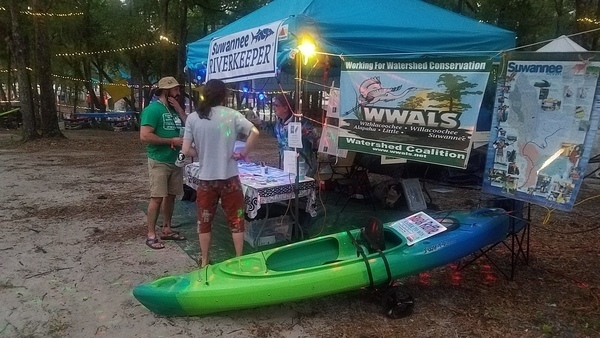 Come join Suwannee Riverkeeper and 10,000 of our closest friends at Wanee near the Suwannee River in the spring. We’ll be holding water quality testing training Saturday morning, and there are all sorts of other opportunities for you to paddle with us and help advocate for the rivers and the aquifer. Plus a kayak raffle! This entry was posted in Festival, Quality, River and tagged As the Crow Flies, Ben Sparaco and the New Effect, Berry Oakley's Indigenous Suspects, Big Something, Bobby Lee Rodgers Trio, Bonnie Blue, conservation, Crazy Fingers, Dark Star Orchestra, Festival, Florida, George Porter Jr and the Runnin' Pardners, Jaimoe's Jasssz Band, Jimi Meets Funk, Juke, Karl Denson's Tiny Universe Presents: Eat a Bunch of Peaches, Les Bros, Marcus King, Midnight North, New Orleans Suspects, north Florida, North Mississippi Allstars, Phil Lesh, Pigeons Playing Ping Pong, Pink Talking Fish, river, Sonny Landreth, SOSMP, Soul Rebels, south Georgia, Spirit of the Suwannee Music Park, St Paul & the Broken Bones, Suwannee County, Suwannee River, Suwannee Riverkeeper, The Chris Robinson Brotherhood, The Main Squeeze, The Terrapin Family Band, Walter Trout, Wanee, watershed, Widespread Panic, WWALS, WWALS Watershed Coalition, Yeti Trio on April 17, 2018 by jsq. Most popular question (after what does Suwannee Riverkeeper do): what about Valdosta wastewater? 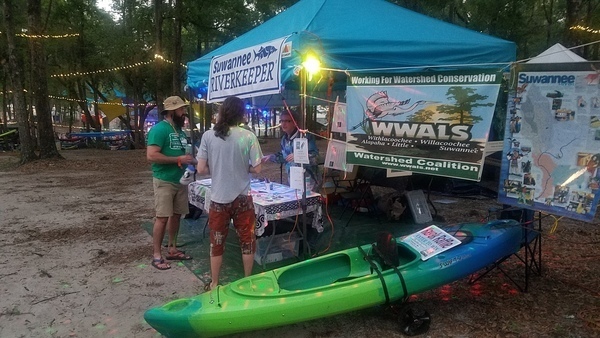 Hulaween hadn’t even started yet, when yesterday afternoon we already signed up one volunteer for the forthcoming WWALS water quality monitoring program. 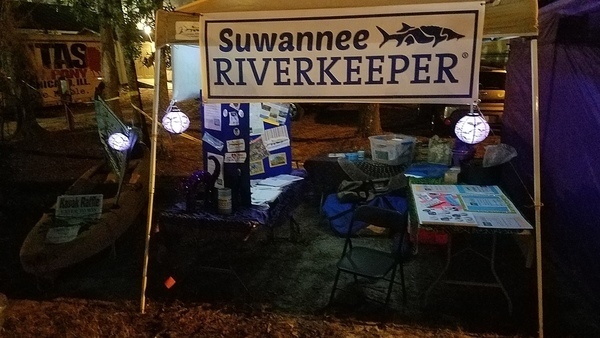 This entry was posted in Festival and tagged conservation, Festival, Florida, Hulaween, Live Oak, north Florida, river, Sara Squires, Scotti Jay, SOSMP, south Georgia, Spirit of the Suwannee Music Park, Suwannee County, Suwannee Riverkeeper, watershed, WWALS, WWALS Watershed Coalition on October 26, 2017 by jsq.